In September, 1940, Qantas Empire Airways was commissioned to fly a number of desperately needed PBY flying boats, ordered for the Royal Australian Air Force, to Australia from United States territory. For diplomatic reasons, delivery had to be a civil undertaking, as the aircraft had been ordered for an air force actively “at war,” while the United States at the time was neutral. One purchasing condition was that each aircraft should be flown to Honolulu under American command, and then it only should be handled by Australians. Sufficiently equipped with trained pilots and technicians, QEA was joined by Captain P. G. Taylor, famed navigator with Kingsford-Smith in the LADY SOUTHERN CROSS in 1934. The first “Catalina” arrived in Honolulu from San Diego on September 26, 1941 after flying the 2,613 miles in 22 hours and 10 minutes. The American crew was replaced by Australians, including Taylor. They negotiated the next leg to Canton Island, 1,911 miles distant, in 14.16 hours. Departing Canton on January 30, 1,988 miles were crossed in 14.37 hours to Noumea, then through to Sydney (1,221 miles) in 9.17 hours, arriving February 2, 1941. 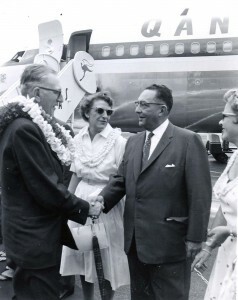 A second delivery flight followed with aircraft A24-8 arriving in Honolulu on August 11, and leaving with its Australian crew two days later. Aircraft A-24-18 left Honolulu on October 17, 1941, on its delivery flight to Australia, stopping at Canton Island the same day, and then on to Suva. 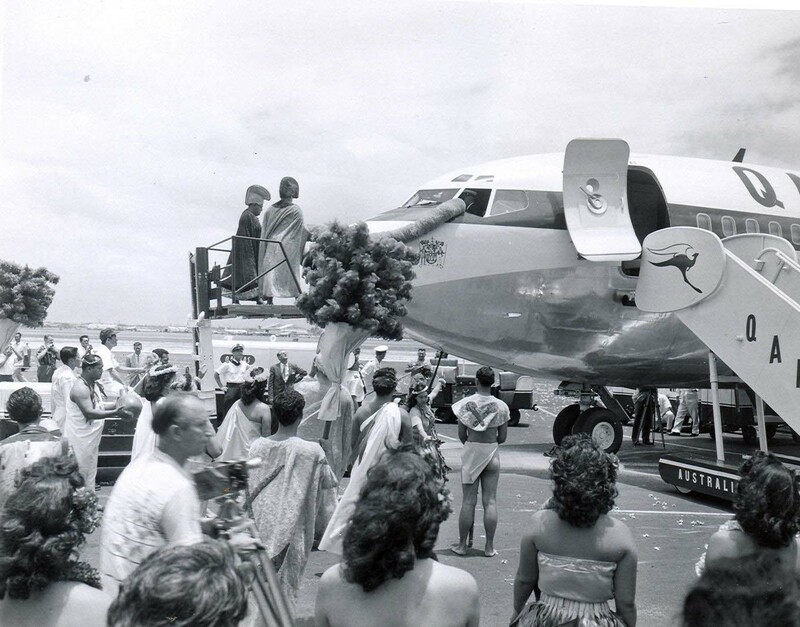 Instead of flying the usual route via Noumea, it was flown non-stop to Sydney. Two small bags of mail were placed aboard and the first non-stop Suva-Sydney flight was off. The plane covered the 2,025 statute miles in 17 hours and 9 minutes. Upon Japan’s entry in the war, Pan American Clipper service from New Zealand was diverted, among other places, via Australia, but continued Japanese advances resulted in cessation of this service. In mid-1942, mails were flown across the Pacific by Britain’s Royal Air Force and by U.S. Army aircraft. A year later, the United States’ Air Transport Command began a regular service to England via the Pacific, followed similarly by the RAF Transport Command. These Pacific services ended in December, 1945, after which mails for Canada and the U.S. were sent through the United Kingdom. British Commonwealth Pacific Airlines (BCPA) was incorporated in June, 1946, by the governments of Australia (50%), New Zealand (30%), and the United Kingdom (20%) to provide a service between Australia/New Zealand and San Francisco/Vancouver via Fiji, Canton Island and Hawaii. Until its own fleet and personnel could be acquired, the route was operated on a charter basis by Australian National Airways, a private company. Their first flight was in September, 1946, and continued operations until BCPA took over the route in April, 1948. In 1954, BCPA was acquired completely by Australia and integrated into Qantas, the first flight over the Pacific route leaving Sydney on May 15 in the Super Constellation VH-EAG. Qantas began the first jet air service across the Pacific on July 29, 1959, operating Boeing 707 jets (the first non-American airline to put the Boeings into service), cutting Pacific flying times by nearly half, with stops of one hour 40 minutes at Nadi, Fiji, and one hour 55 minutes at Honolulu.